It’s a really awesome feeling when you see your photos printed in a magazine/newspaper, or on the wall in a museum, or even someone’s home/office. Nowadays with social media being more & more prominent, seeing your work being posted on a client’s Facebook Business page is just as awesome. Every once in a while, we like to check and see if some of our clients have a FB Business page so that we can “Like” it; and perhaps do some tagging to help with the networking, SEO, etc. 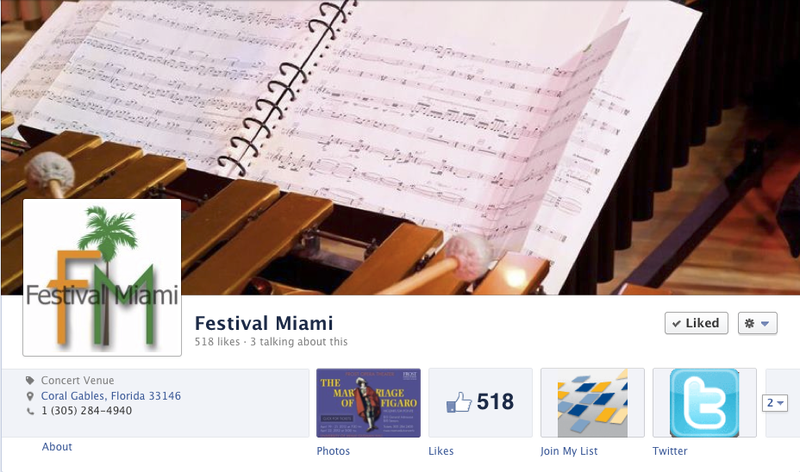 (If you’d like to check it out, our page is: www.facebook.com/SEImaging) Anyways, today I was doing that and saw that one of our best clients, Festival Miami (of the Frost School of Music/University of Miami), used one of our images as their cover photo, and it made us smile! This entry was posted in Clients, Digital Photography, Frost School of Music and tagged Cover photos, Facebook. Bookmark the permalink.